Imagine the scenario, you’ve arrived home from a celebration meal with your significant other half, opened the door and suddenly you witness the horrifying sight of your belongings sailing past you on a tide of water. Yes, you’ve had a flood. What’s more your flooded carpet is under about 18 inches of water. So what do you do? Well firstly, you’ve got to act fast. 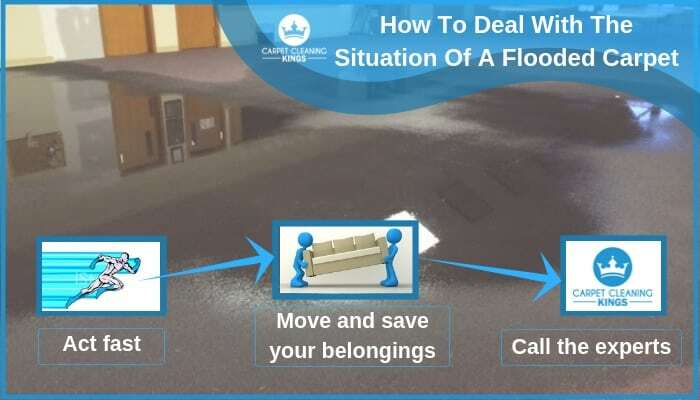 Aside from removing all belongings from the water-logged zone you need to set about extracting the water from your flooded carpet. This has to be done for several reasons. Firstly if your carpet is allowed to stay wet the conditions are perfect for mould growth. Even if there’s no visible mould present, it’s likely to occur within 24-48 hours and even then removal and cleaning might not be able to salvage it. As a result there’s a strong chance it need to be replaced. The other problem is de-lamination. Consider a carpet like a giant sandwich. The top layer being the fibres that make up the carpet area and the bottom layer is the protective backing. Sandwiched in between however is a layer of glue. The problem is that when glue breaks down, or in this case gets wet, it starts to go stringy. Just like a grilled cheese sandwich you can pull the carpet apart to reveal a stringy, melting mess. 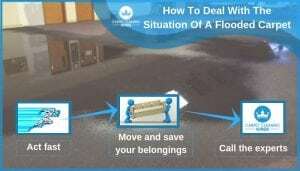 Firstly call in a professional carpet technician who knows how to deal with flood damaged carpet. They have powerful suction equipment that will extract as much water from the carpet as possible. In the meantime look to remove as much surface water from the carpet, either by using mops, squeegees or whatever you have to hand. Once the carpet technicians have removed all the remaining water they’ll then remove the carpet and look to dry it out. Once the carpet has been removed, giant humidifiers are used to dry out the floor and indeed the walls if necessary. Finally contact your insurer. They’ll speak to the carpet technicians and see whether or not your carpet and/or belongings can be saved. If the carpet has been got to quickly enough then a new pad can be put down and the old carpet (provided it hasn’t been cut away from the strips) stretched. If the carpet has been salvaged and re-used then it’s advisable to give it a professional clean (although it’s important to wait a week to let the carpet settle into shape once again. At Carpet Cleaning Kings we have the skills and the experience to deal with all aspects of carpet cleaning including emergency flood water, so if you return home to find your carpet underwater, then act fast and call 1300 7000 75 and let us show you exactly what we can do. DIY Carpet Cleaning – Is It Really Such A Good Idea?